Cats Protection has partnered with PURINA® to highlight the plight of cats who can be hard to rehome. People can walk past cats with health and specific behavioural needs, who are older or shy, but these special characteristics can often make the perfect match for their new owner. The so-called ‘unadoptables' can be the most adoptable cats at the National Cat Adoption Centre. Cats Protection and our long-term partner PURINA® believe that no cat is unadoptable. The Unadoptable Stories campaign is here to help find every cat their perfect match. 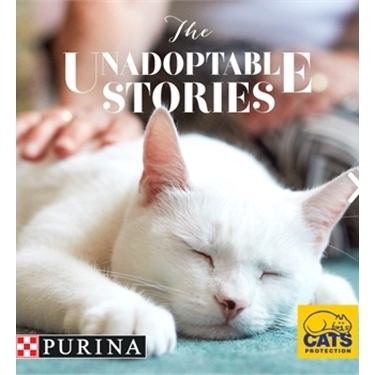 The Unadoptable Stories campaign will be visible across media from 20 August for four weeks. Sainsbury’s stores will host sampling stands in 70 participating storeson Friday 7 September to find out why no cat is truly unadoptable. For example, Sam had hearing problems and was often overlooked, like hundreds of cats with ongoing health needs.Elaine lost her husband and her cat within a very short time of one another and it hit her hard. She came to Cats Protection looking for a friend and companion and met Sam. Elaine and Sam's story highlights the fact that no matter how 'unadoptable' Sam appeared to other families, he was the perfect match for Elaine.Now Sam spends his days keeping 70-year old Elaine on her toes, and his evenings having cuddles. Samantha always wanted her son Henry to feel the happiness that cats can bring but with a cat allergy, she thought she couldn’t have a cat living in the house.But when they met Belle, a special girl with a love of the outdoors, they knew they'd be the perfect match. Our team realised at once that Samantha and Henry's situation would be perfect for her unique outdoor needs.After nine months in care, Belle is now enjoying her new-found outdoor freedom, with her own warm outbuilding to live in, and her confidence has greatly improved. Belle is now enjoying her new-found freedom and her confidence has greatly improved. It may surprise you to learn that a number of the cats in our care are black cats. When Sam and Lara first saw Coco when they were looking for a kitten for their little girls. Lara had always wanted a black cat, after her favourite TV show Sabrina the Teenage Witch.When she met Coco, Lara knew he was going to be theirs. “The girls absolutely love her. Although Coco is the family cat, I’m definitely her favourite. I guess it’s because I feed her in the morning. I do have black hair though, so perhaps she’s adopted me,’ said Sam. We are sharing The Unadoptable Stories to highlight the hundreds of cats and kittens in our care with unique needs. Here at the National Cat Adoption Centre, we believe that no cat is unadoptable. Take a look at our website to find suitable cats in our care.